nicely into the western end of St Thomas' main harbor at Charlotte Amalie. The island has an interesting history. It was originally inhabited by Taino Indians around 500 years ago. Later, it hosted some of the rare Black-owned plantations during the 18th and 19th centuries. 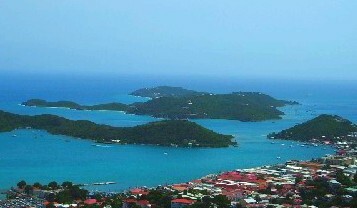 Its name derives from the fresh water ponds at its heart, the only standing fresh water in the Virgin Islands. This water attracted sailors and pirates for centuries. In the 20th century, the island became the province of the military. In 1944 the island was purchased by the U.S. Government and turned into a U.S. Military Reservation. The army began building a fort and barracks there, but abandoned the project when World War Two ended. For a few year after that, the island was used for chemical weapons experiments. In the early 1950's, a trickle of private citizens began to develop the island for tourism and retirement. A small hotel was built along with a few private homes. The hotel was later destroyed by Hurricane Hugo in 1989. Since then, it's been a quiet place with a small community of mostly expatriot retirees, who maintain the island's roads and other amenities privately. There's a regularly scheduled ferry that runs to the island from Charlotte Amalie's Crown Point Marina. It's a nice place to spend a few hours. There are two fine beaches, Honeymoon Beach and Sprat Bay Beach. The roads around the island are quiet and lightly-trafficked, making them good for walking or bicycling. There are some good public fishing piers, and the views from the site of the old army fort are outstanding. There are also houses for rent here, so if you're looking for a quiet alternative that's close to St Thomas (very close), but away from the hustle and bustle, then Water Island is worth a look.